How great is our father, the Guru? All of these demerits, all of these vices, all of these negative things are within us but Sathiguru sahibjee takes them upon themselves in order to explain to us. We are the ones who are moorakh, we are the ones who are mugath - we have no understanding, we are the ones who are agiaan mathee - who have darkness of ignorance, of spirituality. We have that low understanding. But Sathiguru patshahjee takes us by the hand, Guru Maharaj jee themselves, just like a father showing his child how to read, or a teacher repeats in front of the class A B C - it doesn't mean that the teacher doesn't know the alphabet but he is repeating in order for the students. In the same way Guru Raamdaasjee Maharaj is taking on all of these demerits for us who are full of vices so that we can walk upon the path of dharam, upon the path of righteousness, upon the path of spirituality. Guru sahibjee says even though you may be foolish, even though you may not have any understanding of spirituality saranaagath purakh ajanamaa - come into the protection of that Being, that Waheguru, that Lord God who is ajanamaa - who is beyond the cycle of birth and death. But only the One is eternal & can save us from this cycle of birth and death. Only the One who is beyond this cycle can save us. Kar kirapaa - bless me with Your grace O Guru, O Waheguru, rakh laevahu - protect me maerae thaakur - O my Lord God. Ham paathar - I am like a stone who is sinking in this world. Heen - I am lowly, akaramaa - I have no good fortune at all. O my mind, meditate upon the name of God! Only by following what the Guru says, only by and through the Guru's instruction, only by following the Guru's instructions can we paaeeai - can we find the essence of life. The true essence of God's love only comes through the God's instruction. Hor thiaagahu nihafal kaamaa - Guru sahibjee says give up those kaama - those actions which are nihafal. What does that mean? Give up those actions which will not help you. Give up those actions which are deterring you, give up those actions which are pulling you away from Akaal Purakh. Give up those things which are blocking your path to the God. Rehaao - Gurujee says pause and think about this. Those har jan - those servants of the Lord who have become saevak - who serve the Lord sae har thaarae - Waheguru Himself liberates them. Ham niragun - I have no gun - I have no virtues, raakh - save me! The only way I can be saved is through your oupamaa - is through Your grace, by singing Your praises. O my Lord God Waheguru thuhj bin - without You I have no other. Har japeeai vaddae karanmaa - but Guru sahibjee says only those people can meditate upon You who are blessed with great fortune by You. Naameheen - those people who do not meditate upon the Naam, dhrig jeevathae - their life is cursed, why is it cursed? - because it is full of hatred, it is full of anxieties, it is full of anger. Thin vadd dhookh sehanmaa - they have to endure the greatest dhukh. What is the greatest pain? - the cycle of birth and death. Oue - those people fir fir - again and again jon bhavaaeeahi - they wonder in the circle of birth and death, again and again. Mandhabhaagee - they have low fortunes, moorr - they have no understanding of spirituality and akaramaa - again Guru sahibjee says they don't have good fortunes. For the servants of the Lord the name of God is their adhaar - is their support, that is what they live for, that is what keeps them going. Dhur poorab likhae vadd karamaa - they have such preordained destiny written upon their foreheads from dhur poorab. 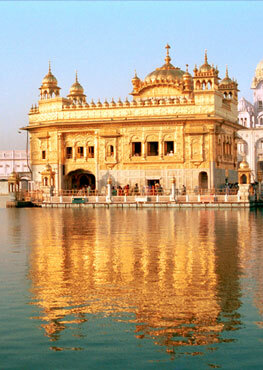 Wahegurujee Himself has written that destiny, that blessed destiny upon their heads, upon them. Those people who the perfect Guru has implanted the name within, has blessed with the name jan naanak safal jananmaa - Sathiguru Raamdaasjee says their lives are fruitful, their lives are blessed, their lives are truly perfect.